We must be notified in writing by November 30, 2018 in order to receive a full refund of the entry fee. Minimum 4-night accommodations at one of the following: Disney's Pop Century Resort, or Disney's Caribbean Beach Resort (based upon availability). 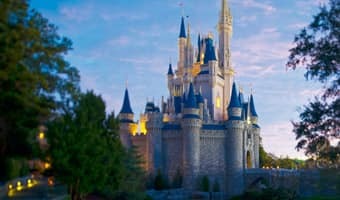 Transportation to and from Orlando International Airport and your Disney Resorts with Disney’s Magical Express. Travel Packages start at $625 per person based on quad occupancy. Spectators traveling with your team can take advantage of specially-priced Walt Disney World® hotel and theme park ticket packages, as well. Your Disney Sports Travel agent can also assist with ticket upgrades, additional room nights, vehicle rentals, and airfare options. 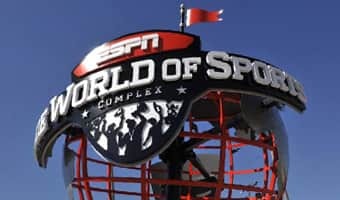 Event transportation to and from ESPN Wide World of Sports Complex is provided at Disney's Pop Century Resort or Disney's Caribbean Beach Resort for those who purchase a travel package through Disney Sports Travel. All teams must provide their own transportation to and from off-site venues not scheduled by the Disney Spring Training team. Transportation to and from the Walt Disney World® Resort Golf Courses and select Disney Resorts is also available via taxi and is provided at no charge. You may request a ride at the Valet Desk or from Bell Services at Resort hotels, and in the Pro Shop or from any golf operations staff members at the Walt Disney World Resort Golf Courses. 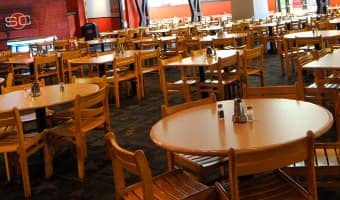 Teams have the option to place catering orders in advance of their trip for quick, easy and fresh prepared meals, bulk beverages, and/or snacks. The convenience of having your meals planned in advance will save on time and stress. Place your order at least 2 business days prior to the event date. Orders for Saturday, Sunday or Monday must be received by 3pm on Friday. When you book your 2018 Disney Spring Training travel package, consider adding on the Disney Dining Plan. Disney dining plans are a convenient and flexible way to enjoy meals and snacks at many of the restaurants and food service locations at Walt Disney World Resort. Dining plans can be used at our theme parks, at Disney Springs, and at Walt Disney World resort hotels. Guests at ESPN Wide World of Sports can use dining plan credits at the ESPN Wide World of Sports Grill*, at the Tailgate Grill Food Truck and at select roaming food carts throughout the complex. For additional pricing and booking options contact Disney Sports Travel at 407-939-7810, or email wdw.disney.sports.travel@disneysports.com. Capture every exciting moment of your competition with the ESPN Wide World of Sports Gameday Photos Service. You can register your team for a Team Photo CD for only $10 per athlete and coach. Your entire team must add this option to their travel package in order for this discounted rate to apply. The price includes a Team Photo CD for one game (minimum of 150 photos). Additional games are available for purchase. Photographers will be scheduled to photograph at our discretion. Schedules are subject to change due to weather, game delays and other unforseen circumstances. Reservations subject to availability. For more information, call Disney Sports Travel at 407-939-7810, or email wdw.disney.sports.travel@disneysports.com. Access GotSport to complete schedule requests by November 16, 2018. Please visit the links below to view Disney Spring Training rules. Head coach: we want to make your travel worry-free so you can keep focus on the season ahead. That's why, when you book your Walt Disney World® Resort package with your team this year, you'll receive a special $500 credit toward your stay. * Head coaches call 407-938-3800 for more information. * This offer is valid only for 2019 Disney Spring Training packages, purchased through an authorized representative. 2019 Disney Spring Training package requirements include a minimum 4-night stay and a minimum 3-day Magic Your Way® Base Ticket. The number of packages available at this rate are limited and advance registration is required. This offer is subject to availability, non-transferable and cannot be combined with any other offers, promotions, coupons, or discounts. Offer may be withdrawn or modified at any time without notice.